I found a good article in Business North Carolina about the economic growth of the Triangle in the next 15-16 years-from the perspective of business execs in the area. Its staggering to think of the population doubling during this time period. That is very interesting indeed. I do hope NC can find ways to curb the high school drop out rate though. It was also very interesting reading that the area brought 36 CEOs and academicians together to come up with a five year plan. In today's economy you have to stay on top of things and it appears that Raleigh is doing just that. And doubling the population in just 15 short years is nothing short of incredible. And think about the clout the region and state will have by that time especially when you have a metro area with a population from 2.5 to 3 million strong. There's no shortage of students here. I think Cary might want to look into starting a major university on the UNC system, seeing as it's large enough to support one on its own. What would that make us; the quadrangle? I think that is what makes this area (RTP) unique is that we have such forward-thinking business and academic leaders (for the most part). I, however, don't have such a high view of politicians in the area and the state as a whole. Unfortunately many of the decisions that affect us at a business or academic level are dictated by these people-including major infrastructure needs as well as educational resources. It will be very interesting to see what the future holds. I do hope NC can find ways to curb the high school drop out rate though. A few ideas would be raising the drop out age to 18 and when students are inclined of not wanting to go to college by preparing them for trade school or learning masonry/carpentry/etc. Not just the rural areas would benefit but in the metro areas, there will be more skillfull workers handling the endless construction of new development throughout the metro areas and elsewhere statewide. Yeah, that rail project makes NO sense! I mean, why ride a train when you can commute 2 hours each direction from Clayton to RTP with a gazillion new neighbors? Good news for Raleigh-it should have strong. sustained economic growth for 2006. With all the criticisms levied against the city they are obviously doing something right, economically that is. Hopefully this will translate into even more urban development/redevelopment. Hmmp hmpp - HEY!!! Are you reading with us IKEA, Dean & Deluca, Bloomingdales, Eatzi's, Southern Market, Crate&Barrel Furniture, Johnny Rocket's, Chapel Hill Restaurant Group??? The part about being careful about having a split pesonality is interesting. That statement seems to relate precisely to the question of how do you market this city? How do they determine the wealthiest city? I would think Charlotte would take that crown having the worlds two wealthiest banks headquarted there. Perhaps I'm crazy, but this title seems a bit skewed. Its based on per capita income. I guess those banks don't pay their employees that well. Well first of all thats 2 employers and no banks do not pay all that well except if you are at the top. Well I guess that this is just one more reason why Raleigh is better than Charlotte. With so much positive growth and construction across the Triangle, a strong housing market and construction of I-540 and the Western Wake Freeway, Silvia cautions that Raleigh needs to be careful not to have a spilt personality. "You really have to make some tough choices here. You can't do both," he said. "You're going to have to decide how important it is to have that urban retail living core, versus putting the infrastructure out in the suburbs somewhere." With all of the construction projects downtown and new proposals being presented every day, Dr. Silvia also warns not to overpromise new projects. Rising energy and construction costs will likely remain high. I'd be curious to see how strong the economy of Raleigh is if you analyze the growth of industries that are not directly related to perpetuating urban sprawl. If housing and construction are what keeps the economy afloat, then if we hit peak oil soon, rising energy prices will stab Raleigh in the heart as it becomes pointless to live 30 miles from your job because of high oil prices and chronic underinvestment in transit. Yep, the cheap energy economy will..when it collapses, bring a lot of folks down with it...entire citys such as us "new" south types even. This article just says... "Raleigh is the Wealthiest City in NC" It does not give any rationale as to why they are able to make that conclusion. No numbers, no stats, no data. i'm sure if you monkey around with statistics, any city can be the wealthiest in some form or other. It's nice to hear positive news about our region at any rate, and I hope some of this "wealth" can be used towards decent mass transit or we're all doomed (agreeing with Jones133). 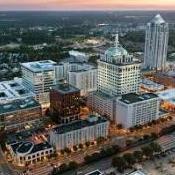 The stats have always shown that the Triangle/Raleigh has a higher per capita income than Charlotte. This makes sense as tech/high skill/academic jobs tend to pay more. There was an article in one of the national business magazines that listed Raleigh/Durham as one of the wealthiest areas in America a couple of months ago. I also remember seeing stats that showed per capita consumer spending was also higher in this area. It's probably all the pirate gold that they found when digging up Fayetteville Street Mall. I wouldn't put too much into it, I'm assuming its some per capita measurement which really doesn't mean too much. Probably within 1-2k of the other big 5 cities. I would like to see some actual numbers where a comparison could be made. There was another post just made in the CLT forum where that city's median income was the 15th highest in the entire USA. I have no idea if that was true or not. I would think Charlotte would take that crown having the worlds two wealthiest banks headquarted there. Perhaps you're using hyperbole which is OK I guess, but let's make it clear that the world's largest banks are definitely not based in Charlotte. Wachovia isn't even in the top 10 worldwide. Although, having the US's #2 and #4 banks in Charlotte is nothing to sneeze at.